The war in Iraq seems to be something that the general population has shoved into a tightly closed box in their memories, something that happened “a few years ago that we would rather not talk about”. I don’t think people had any idea, have any idea, what it was like out there. I don’t really myself, only the images I have seen over the years on TV, and the words that came out of my friend’s mouth when he stayed with me for three days before going back to his family for his two weeks leave. NYC and my party lifestyle were the buffer between what he saw every day in Iraq and the life with his wife and kids he had to go back to for a while. I listened, but still had no real idea. I was intrigued when I read that Brooke King had written her own memoir about life as a female soldier in Iraq, and life after deployment. It’s rare to read about modern war and combat from the perspective of a woman soldier. There is a moment in the book that struck me to the core, and I think it is extremely telling: on her return Brooke makes the move to go to the VA and seek help for her nightmares and general anxiety (and so much more than that). She mentions that she has been in combat and instead of listening to her they take her down to an area where all the severely injured vets are and tell her to stop lying. Women don’t see combat. Right? How removed from reality does the population of this country need to be to not even to begin to understand the wars that their country is fighting, the people who are fighting for them? 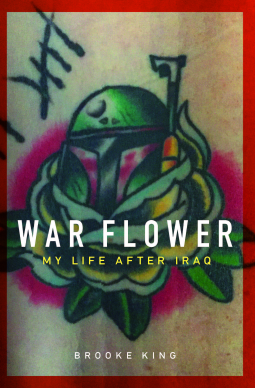 War Flower is written as a collection of essays, some of them more poem than prose. The timeline kind of jumps around all over the place which has its good sides and it’s not so good sides. I like how it vividly portrays the confusion, the darkness and the surrealism of war, specifically the war in Iraq. I did find it a little annoying at times because nothing flows, the chopped up approach works for the most part but can be a little frustrating. I had to put it down for a day but found it too compelling to leave for longer... That said you can read each chapter as a stand-alone story, which has its benefits. This is in no shape or form an easy read, but it is in my opinion a must read. Brooke is a brilliant writer, a poet, and she doesn’t beat around the bush. You read what she saw, she doesn’t whitewash war for the reader, which I’m glad about, even though there are passages that will make you want to vomit. You are not going to read about what you imagine you are going to read about. But you are going to read some hard truths: death, violence, PTSD, the war machine and the erasure of humanity in each other, the erasure of self, and more death and violence. You leave as a 19 year old and come back as a 21 year old carrying the baggage of war, violence, and death, and are expected to tuck it away and make it into something palatable for us to digest. It’s easy for us to sit at home and judge based on what we see on our screens. It’s easy for us to think that we can ask soldiers questions we would never think to ask anyone else (I mean who asks a soldier how many people they have killed? What kind of effed up question is that?! ), and it’s easy for us to forget about wars when they aren’t on our home ground and don’t technically affect “us”. War Flower provides a different, but necessary perspective on modern war, and on war as a female soldier. Thanks to Netgalley and the publisher for the advance copy! A harrowing, stark read that will give you a new perspective.